Free Printable Fall Bucket List — Powell & Co. Tomorrow is the first official day of fall (though you wouldn’t know it from the weather here.. it’s 91 degrees today!). I absolutely LOVE fall. I’m not a pumpkin spice gal, but I can still totally get behind all things autumnal. The reduced humidity, sweaters, the cooler temps, flannels, beautiful sunsets, and HALLOWEEN! What a time to be alive! In my neck of the woods, fall comes and goes SO quickly. This year, I want to be intentional and soak up all of the fall goodness that I can. 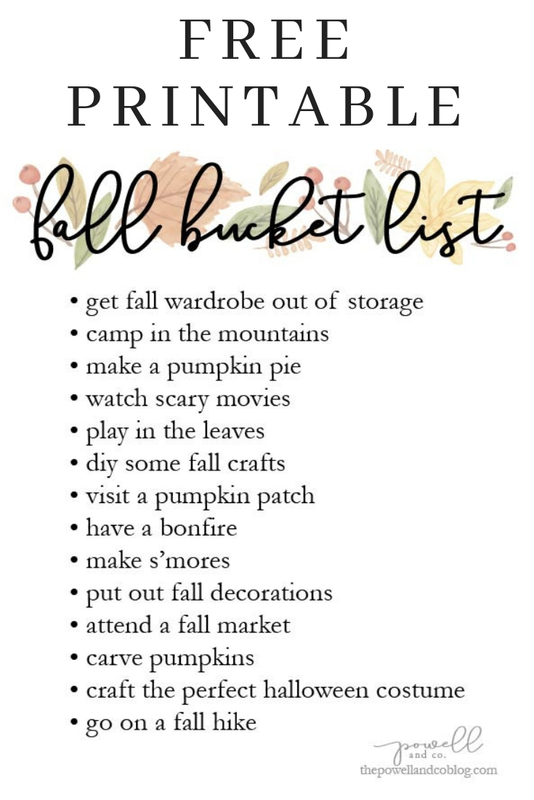 Being the list-obsessed weirdo that I am, I decided to make a free printable fall bucket list to share with you all. I’ve also included a blank free printable fall bucket list, so you can come up with your own! Click here to download my free printable fall bucket list. Click here to download the free printable blank fall bucket list. What’s on your fall bucket list? Be sure to share in the comments or on Instagram!